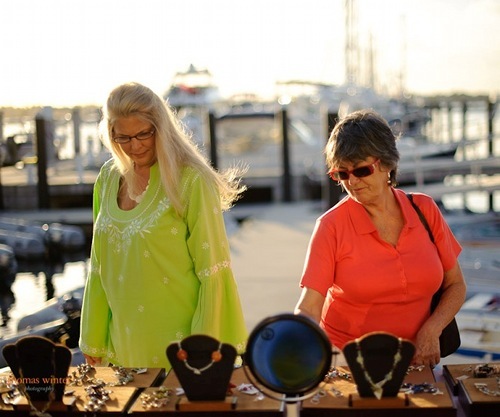 The Arts Council of Martin County & Sunset Bay Marina invite you to come by land or sea to Waterfront Wednesdays at Sunset Bay, a weekly arts and fine handcrafts show featuring local artisans. This new waterfront, sunset and sea focused event is a great opportunity during the Holiday Season to buy, hand crafted holiday gifts for everyone on your shopping list. 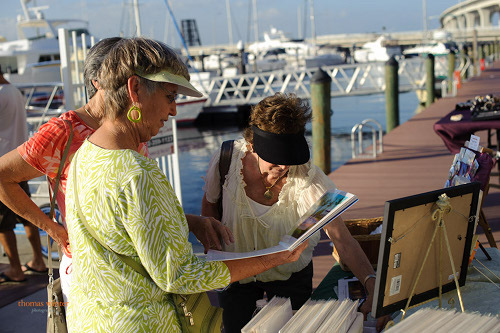 The marina sets a perfect stage for select artisans to display their finest works portraying Stuart’s connection to the ocean, inlets, rivers, waterways, bays and lakes. Enjoy art, music and nature’s stunning sunsets over the St. Lucie every Wednesday from 4 p.m. until sunset. This free-to-the-public event includes free parking on and off site, shuttle service, valet parking, and dockage on the marina transient and dinghy docks. Larger vessels may use the fuel dock after 5 p.m. Participating artists include photographer Eric Wickstrom, painters Ruthann Hewson, Linda Schoppmeyer, and Bruce Wells; jewelers Francia Yaffe and Sam Uberbaum, clay artist Kym Sheppard, textile artist Judy Nichols. The line up of artists will vary each week to offer an array of styles and genre, keeping the event interesting even for the most dedicated guest. A variety of performers will be integrated in the event as it matures offering music, storytelling and other engaging experiences. 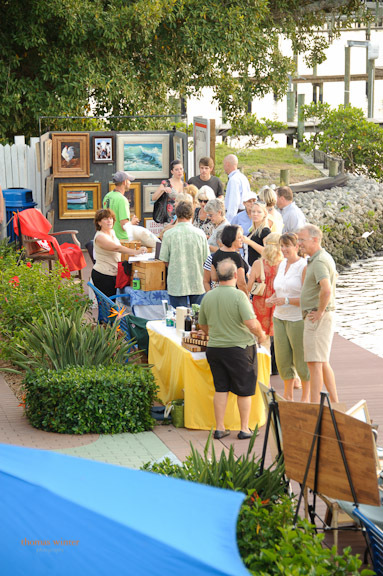 Waterfront Wednesday was launched on November 16 in partnership with the Sunset Bay Marina and Anchorage in order to offers a weekly opportunity for artists to meet new customers and for residents and visitors alike to enjoy our natural beauty and the artists’ creativity. As the designated local arts agency for Martin County, the Arts Council believes strongly in providing enhancements to our arts environment that allow artists to thrive as professionals and to provide opportunities for visitors and residents to engage in the arts. This event will grow over time and will provide a positive economic impact to downtown Stuart, the participating artists and the sponsoring businesses. While speaking of economic impact, The Arts & Economic Prosperity III report provides compelling evidence that the nonprofit arts and culture are a significant industry in Martin County – one that generates $16.8 million in local economic activity. This spending – $12 million by nonprofit arts and culture organizations and an additional $4.7 million in event-related spending by their audiences – supports 456 full-time equivalent jobs, generates $9.9 million in household income to local residents, and delivers $1.4 million in local and state government revenue. This economic impact study sends a strong signal that when we support the arts, we not only enhance our quality of life, but we also invest in Martin County’s economic well-being. The Arts Council of Martin County provides services to visual and performing artists, arts organizations, students and the public. The Arts Council believes that the arts are a basic and vital component to an individual’s development and life fulfillment. Programs and services of the Arts Council cultivate and celebrate the values of artistic appreciation, creativity and freedom of expression. The Arts Council encourages programs that create opportunities for artists and arts organizations to strengthen their resources and reach all segments of our community. For more information, please call 772-287-6676 or visit www.martinarts.org. The Arts Council is sponsored in part by the Florida Department of State, Division of Cultural Affairs, the Florida Arts Council, the National Endowment for the Arts, the City of Stuart, Martin County Board of County Commissioners, and private contributions.